Found a job posting that just screams dream job? Well, the employer is probably on the lookout for their dream candidate. So, you’ve got just one shot. Don’t mess it up! Don’t worry, we’ve got your back. 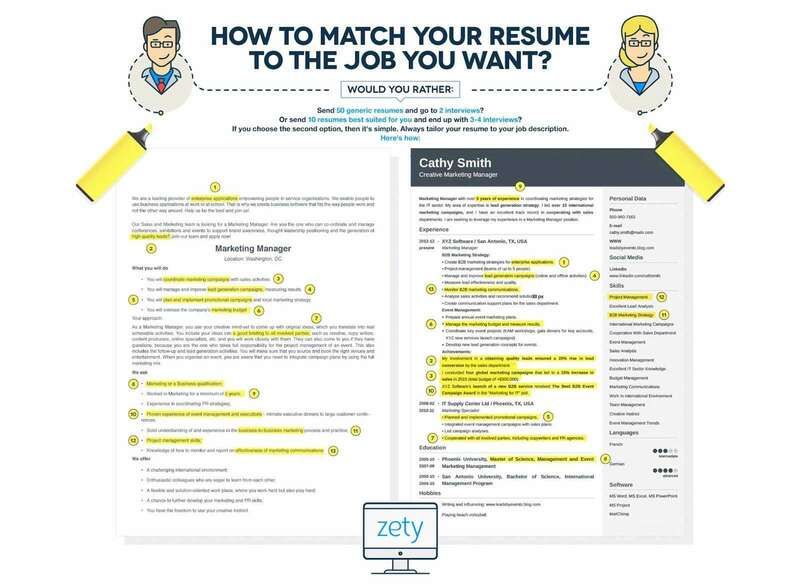 If you want to secure that job interview, this infographic will explain how to tailor your resume to the job ad and the employer’s needs step by step. Trust us, if there’s one thing that will prevent your resume from landing in the discard pile, it’s turning in a well-tailored application. First off, carefully read the job advertisement. Highlight any words or phrases indicative of what the recruiter requires of a prospective candidate. Sometimes it’s obvious: if the job ad says you have to be proficient in Spanish, you have to be proficient in Spanish. However, sometimes the job descriptions in ads aren’t as explicit. You might read that the perfect candidate has to have, say, experience with presenting products to larger crowds. Just think, you’d actually need several specific skills to pull that off. For starters, you’d need great communication skills (more specifically: public speaking). But you’d also need flexibility, confidence, experience working with clients face-to-face, and more. Do some brainstorming. Write it all down. In the end, you’ll end up with a convenient list of required skills, traits, and experience that will fit your potential employer’s requirements like a surgeon’s glove. Pro tip: There’s another infographic on explaining how to put skills on a resume. When you sit down to write up your resume, use words and phrases from the ad itself. At the same time, don’t go out on a copy-pasting spree. The end reader is a human, so make it readable. The idea is to mirror phrases used in the ad to make sure Applicant Tracking System (ATS) software is on your side. These nifty little apps scan hundreds of resumes and match them to a list of requirements (i.e., the job ad). They’re not the smartest cookies in the jar, so they rely heavily on whatever the decision makers feed into them. Help them out by using the vocabulary they know. Sprinkle the most important skill keywords throughout your resume. You should include your experience section, skills section, and resume objective or summary. Want to see what this looks like in practice? Have a look at our resume examples. Still not sure what tailoring your resume looks like in practice? Consult our infographic below to see the entire process laid out in a few quick steps.